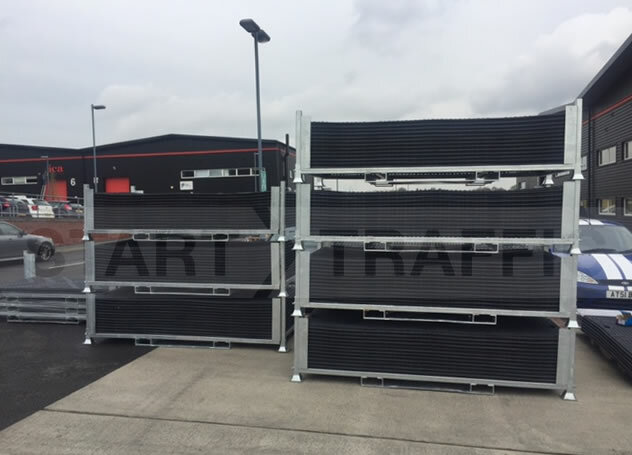 These galvanised stillages are explicitly built to make Euromats as easy to store and transport as possible. Each stillage is supplied empty (unless purchased with mats separately) and can hold up to 25 mats. There is a small area between the fork slots that allow for secure storage of fixings and fasteners. This keeps the links used to connect the mats safely with the mats. The stillage is galvanised and therefore will not rust if left outside. These stillages can interlock to facilitate stacking, making the storage of the mats very secure and compact. Great, give us a call, we will happily assist you with any questions that you may have. Want to buy some mats at the same time? We can do you a deal! Our sales team are available on 01905 794 875 to make sure you get the right product at the right price.